Comprehensive review of Loreal Sublime Bronze Self Tanning Gelee. See what the experts and actual users have to say about this self tanning product. Loreal Sublime Bronze Self Tanning Gelee is a really nice self tanner, especially for guys. It goes on as easy as any self tanner out there, dries super fast, and produces pretty nice color. It’s only downsides are how long it lasts and a very slight tint of orange in the color (that some testers noticed). But overall, this is one of the better “drugstore” self tanners out there. In fact, it works better than some other products that cost 3 times as much! Loreal Sublime Bronze Self Tanning Gelee comes out of the tube as a clear gel. It’s extremely lightweight and ‘feathery’. Putting this self tanner on is very easy. In fact, it’s one of the easiest self tanners to apply that we’ve seen! As we just mentioned, it’s very lightweight, which means it doesn’t take much work to blend it in. Now, it doesn’t have any tint or guide to it, which isn’t a big deal for us, but some people like seeing where they’ve put the product. Loreal Sublime Bronze Self Tanning Gelee dries really fast. 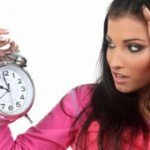 In fact, it dries so fast that you can go to bed without worrying about your sheets– something we can’t say about a lot of other self tanning products. Overall, this product is a joy to apply and use. This self tanner has a very pleasant, very fresh scent to it. It’s pretty strong, but not overpowering. 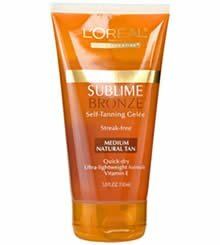 Loreal Sublime Bronze Self Tanning Gelee maintains the same smell on your skin as it does out of the bottle, it’s just a little lighter the next day. We didn’t notice any “self tanner smell” that you typically get with “drugstore brands” like this one. All-in-all, we’re pretty satisfied with the color produced by this product. It’s a fairly dark bronze that will look great on most people. Unfortunately, it did have just a tad of that “orange” color that self tanners try to avoid. It’s not awful, and definitely shouldn’t keep people from buying this product, but it is there. Loreal Sublime Bronze Self Tanning Gelee starts to fade quite a bit after about 3-4 days. We also didn’t like the way it faded. We noticed quite a bit of blotchiness and scaliness, especially on our legs. Absolutely. The smell of this one is just about perfect for guys– it kind of smells like a men’s product to be honest. 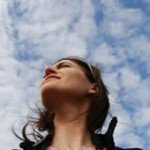 The easy, clean application of this product will also appeal to many men. Loreal Sublime Bronze Self Tanning Gelee costs about $9.99 for a 5 ounce tube. That works out to about $2.00 per ounce, which is a great price. To buy Loreal Sublime Bronze Self Tanning Gelee, click here.